Iraqi Bloggers Central: RhusLancia: Five Month-iversary! I had been riding my three-year old on my lap for a time. We had gone wandering a bit, and then had settled into doing slow laps on an ad-hoc track I had strung together in the vicinity of our vehicles. The track generally circled the perimeter of the open area where my five year old son and his four year old friend were riding. My family has been going to the desert pretty often lately, and it's been fantastic transitioning my son from outrigger-style training wheels to full two-wheeled independence, despite a corresponding increase in crashes. No serious injuries yet, but there's plenty of time for that. The track was simple, really. 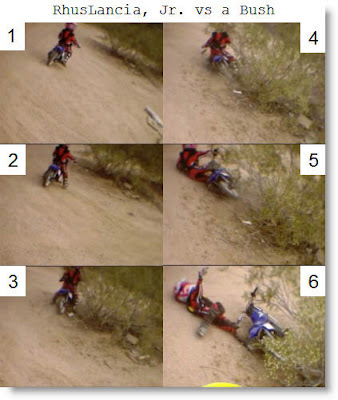 It was just a collection of about half a dozen familiar, well-worn turns that had formed berms or ruts, with three or four flat sweeping turns that connected them. The dirt where we were riding was hard-packed with a gravelly covering. When it's dry, it's very slippery to ride on. When it's wet, and it doesn't matter how wet, it's as tacky as a fully prepped motocross track, and a good one at that. This day it was dry. However, I was having no trouble finding traction. There was a bonus in that I could inventory my kids and the others riding as I clicked off laps. So the effect was that I would blast out of a left-hand turn, glance left to get a fix on the others, slam into another left-hand turn and determine how hard I could go down the next straight, the fastest one on the track, based on their locations. Usually I could go as fast as possible, but if a kid was nearby I'd go slower and give them a wide berth. The next turn was a righty with a high berm that I jumped into. The trick here was to lean the bike over in the air so that the compression of the landing would press the bike into the berm, and then to hammer it coming out. Next, there was a series of S-turns that featured deep ruts with an impressive arc and lean angle. The whole track was flowing together in a way that would make even Csikszentmihalyi smile. It was mid-morning, and our Baghdad-esque temperatures hadn't set in yet, but it wasn't exactly cool, either. After several laps I started to feel it and began to think about coming in for some water. Just then, two riders who had been watching pulled onto the track. I was riding very well, so I asked myself the obvious question: "can I take them?" I sized them up. Usually you can tell how serious someone is (and by extension, how fast they are) by their gear, the bike they're on and its condition, and a quick glance at their riding style. For example, beginners usually sit too much, too far back, and they drop their elbows to their sides. The first rider was on an older bike that had black plastic and cut fenders. He was wearing full riding gear, sans jersey or shirt of any kind. He was either unaware of the cheese-grating effect of creosote bushes on exposed flesh, or didn't care. But in the whole, he looked like a Metal Mulisha guy. In other words, a freestyler or freestyle lookalike/wannabe. I predicted no trouble pulling him. The other guy looked more serious. His bike was fairily new, in good condition, he had numbers on it (suggesting but not guaranteeing that he races), and he was in full gear (including a jersey). So I stayed on the track long enough to determine that I was faster than the first guy easily. And while the second guy did better, I steadily pulled away from him too. The track was mine. That was Wednesday, May 16th, where, on the other side of the world, Iraq was commemorating its first Mass Graves Day. I was aware of this contrast even then- I was having a great time with friends and family, while Iraqis were commemorating their grim past while at the same time dealing with their grim present. 1) so many blogs, so little time! There are so many interesting Iraqi blogs out there these days it's impossible to keep up with them. A single trip down just the active bloggers on IBC's blogroll is guaranteed to occupy your attention and keep you fully away from what you're supposed to be doing. The best one can hope for is to find some whose style, experiences, or viewpoint captures you & get to know them. 2) I have a few favorites. I like the Iraqi bloggers who present a somewhat balanced view. This is no easy task given how polarizing the war has become, but there a few who stand out in that regard. For me, 24 Steps to Liberty and Treasure of Baghdad are two I rarely miss. I like their writing style, and I think I've learned a great deal from those two friends. 24's wit really comes through on his posts, and Treasure of Baghdad's passion & emotions make for a roller coaster ride through posts. Iraqi Mojo is another great blog to read, and you'll also see him in many comments discussions as "Iraqi American". Iraqi Konfused Kid is possibly the funniest & one of the most incisive Iraqi bloggers there is. I see now he's evoking South Park, too. Sweeeet. Sometimes it's nice to go to either end of the perspective spectrum. Riverbend never fails to eloquently express how much better things were in Saddam's day, and the brothers at Iraq the Model reliably give optimistic insights into Iraqi events. If you want to read the king of the Armchair Insurgents, though, Truth About Iraqis is your man. Not to leave Zeyad out of course. His comment section, in particular, consistently produces some of the longest comment threads ever. 3) Commenting is _____. Well, I don't know. There's no doubt that if you want to dicuss something, learn more about something, express support or condolences to the Iraqi bloggers, ask questions of them about life or experiences, the comment sections are the way to go. They are also the place to go to face off against die-hard adherents to this or that position, sling verbal poo at each other, or get off on wild tangents that have nothing to do with Iraq, or much to do with anything in particular. Over @ Zeyad's, a few commentors have spread a discussion about The Pope/Catholicism/The Maronite Church over dozens and dozens of comments and several blog posts. I used to think I knew who started it & why, as well as what it was about. Not anymore. On the other hand, it's really bizarre to be able to talk to "the other side", whether they are just slightly so or rigid propagandists, cheerleaders, & apologists for the enemies of the US and a free Iraq. 4) Fanatics are fun. Some of the most ardent opponents of the US & Iraqi gov't come across as pretty intelligent & well read. They have just thrown their lots in against the US and anything it does. It's quite interesting to engage them and see where they are coming from & why. Did you know that the origin of everything bad in the universe was not the election of George W. Bush in 2000? No, that merely continued everything bad. But the origin was US involvement in the 1953 overthrow of Mohandes Mosadegh, the democratically elected leader of Iran. It's true, ask them. But the most fun fanatics are the ones who hold whatever "anti-establishment" view they read about on their support network on the web without any supplementary background on the subject, willingness to learn about it, or room in their perception for facts, proof, or logic. One recent example was bushbashr45221 who stated at one point (about Saddam): "Well, he did kil some ppl, and I can't justify that, but he was mostly a good man especially compared to the crooks he was fighting." The whole thread was like that. So much so that the lefties were trying to settle him down since he was embarrassing them, or wondering if he was a "false flag" commentor planted to make them look ridiculous. I believe he was a twelve year old rebelling against republican parents or something. He certainly wrote like it. "Le Resistance" - this was how I used to refer to the insurgency in Iraq. It's a play on the French Resistance of WWII since US opponents like to evoke them in playing up noble and patriotic motives for their heroes. I largely reject those motives and used the term always in italics to convey contempt. "Insurgents and their terrorist allies of convenience" - another term for the insurgency. I have been sceptical that there really is much of a separation between those fighting just us (and the Iraqi gov't) and those who target Iraqi civilians en masse. Certainly the latter believe themselves to be the former, so why should we split hairs? "The Muqawama" - yet another term for the insurgency. This one adopts the phrase used by one of our most familiar anti-US propagandists (you know who you are), and uses it usually in the same sentence as a description of another mass-murder of Iraqi civilians. The intent, as usual, is to not ascribe traits of nobility to the insurgents in Iraq. "Insurgents/Terrorists" - my latest term to describe them. This one is just shorthand for the fact that I don't let the "Islamic State of Iraq" off the hook because they just killed a few Americans when the "Islamic State or Iraq" also just blew up yet another marketplace. Potato/potatoe, tomato/tomatoe. "People who don't give a rat's *ss about Iraqis" - this could be anyone, but I've used it most to describe the attitude the Dems have towards Iraqi civilians. Just try to find some concern for the fate of Iraqi civilians in anything the Dems say about Iraq, or any plan they've put forth. Help me out with this; I can't find anything. Many of the so-called antiwar people likewise have little to say about the fate of Iraqi civilians. There is a somewhat common delusion they hold that things will magically get better if/when we leave, but when it comes down to it I don't think they really belive that. They just don't care. 6) I'm not a writer. That should be obvious. But I'm most surprised with how much more difficult it is to write somewhat original things instead of to respond to someone else's writing. Oh sure, I can think about roughly half a dozen topics per day that may make a good post, especially as I read the day's blog posts and news events. But, getting the time and Muse to write one out is a skill I'm very much behind the curve on. 24 Steps & "Le Resistance": I think 24 Steps to Liberty and I share a certain contempt for the "resistance" in Iraq. Still, I had been mocking them with my "Le Resistance" Rosy Fingered Dawn in his comments when he came on and reprimanded me for talking about the murderers of his people in that way. I respected his wishes, but the irony is "other commentators" post glowing praise for the people killing his people en masse week after week, with nary a complaint from him. I've seen the same phenomenon elsewhere. Still trying to figure it out. 24 Steps & the Adhamiya Wall: 24 Steps to Liberty had a post about the Adhamiya wall not too long ago. This was on the front side of the outrage the wall was to produce. I commented a bit glibly that maybe it would work and they could have a wall dissassembling party a'la the Berlin Wall when they were no longer needed. He was not amused, and said so. My comment is first, his irritated reply is at 8:53 AM. Treasure of Baghdad & US Arming of Saddam in the 80s: I was having the oft-repeated discussion about how the US "armed Saddam" in the 80s. Of course, we gave him some arms, but hardly a drop in the arms bucket compared to the USSR, China, & France. BT came on and gave the Iraqi viewpoint: they were in a war, of course people armed them. Duh. I think this is the best zinger against me ever. I'll try to find the link. OK. I'll go ahead and wrap this up with a handy guide to Iraq's ethnic and sectarian breakdown. Sometimes I like to think this is what Bremmer explained to SCIRI in order to get them to support democracy, and also why the minority is so committed to overwhelming violence to get their way (which worked quite well in the past). The Kurds, of course, are the exception. Maybe they just see their 1.5 M&M share and realize having the US as an ally isn't so bad after all? From the comments, Mohammed ( from Last of Iraqis) pointed out the the Sunnis should have four M&Ms. That's pretty much true, and reflects a little-known fact that the Kurdish ethnic group is also majority Sunni. When you add them together, the Sunna are 32% - 37% according to the CIA factbook on Iraq. Not that that is the last word on the issue, but it's probably accurate enough to cite. So, here's an alternate version of the graphic.